In civil services examination preparation, December is an important period. Many candidates start their preparation from this month. For some, they are halfway in their journey to prelims. Both for beginners and already preparing candidates, analysing the trend of the previous year’s question paper is necessary at this stage. It will give you a perspective on how to approach your preparation. 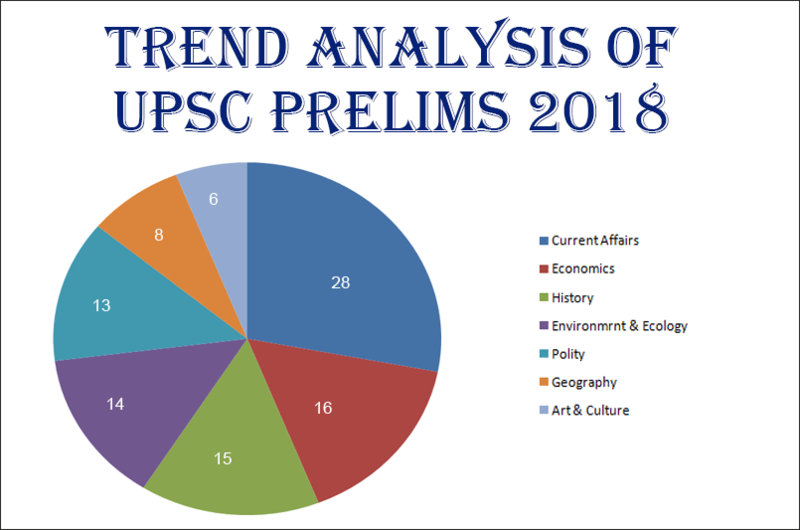 In this write-up, we try to provide an accurate trend analysis of Prelims 2018 question paper. Prelims 2018 was a jolt from the slumber for many. It can be branded as moderately difficult to a difficult exam. Paper 1, general studies was a test of intelligence, observation, attention and memory. While paper 2, CSAT showed why it should not be underestimated. For the past many years the dominance of current affairs in prelims is palpable. It was the same in 2018 (check the table below). Apart from direct current affairs questions, questions from other sections too had a hint of current affairs in them. Take a look at the question below. It is both a geography question and current affairs question. In the early months of 2018 Barren island volcano became active after being dormant for many years. Within current affairs, questions were majorly from science and tech. The others were related to international relations, surveys and indices, places that were in news etc. UPSC really touches a wide array of issues. One of the trends that are emerging in prelims is questions on topics that were more than a year old. It happened in the 2017 exam and it continued in 2018. For example, the question on the leader of the opposition. The issue was more than a year old, yet it was asked. This shows that UPSC is unbound of time. If we look at the 2017 and 2018 papers closely from the above angle, we can safely assume that one has to study current affairs topics of at least two years. It is difficult to admit (even for engineering students) that CSAT is becoming a tough nut to crack. For two years, the toughness of CSAT is increasing. Even after doing good in the gs paper, many have not qualified for mains because of CSAT. Especially in the year 2018, CSAT was pretty tough. A candidate who had practiced regularly will surely be successful. So, it is futile to neglect CSAT. Thus, while preparing for CSE lay emphasis on current affairs, prepare notes regularly and practice CSAT more.